A versatile high temperature coating that is proven to achieve outstanding energy savings and refractory protection. It can be used alone or as a base coat for other ITC products. It is used as a covering for ceramic fiber insulation or castable refractory. This material reflects radiant heat back into the furnace or forge to achieve high temperatures quickly and efficiently. A durable compound used to repair broken, chipped or cracked brick, castable or fiber material. Bonds rapidly and eliminates need for costly re-bricking. Repairs old equipment economically and efficiently. A strong abrasion-resistant compound for repairing areas exposed to harsh environments and mechanical abuse such as tundish, ladles, troughs, crucibles and door jambs. Use also on walls and floors that are in contact with molten metals. This is an outstanding product especially formulated to protect metals and graphite, including those directly in contact with molten metal. It helps to prevent stainless steel and steel parts from erosion, oxidation and fatigue from prolonged use at elevated temperatures. Use also to repair damaged areas. A high purity ceramic top coating that resists deposits from firing gasses and from contact with molten metals. Increases energy efficiency by reflecting heat back into the furnace or back into the melt. Helps to reduce contamination of subsequent firings from the by products of the previous heats. 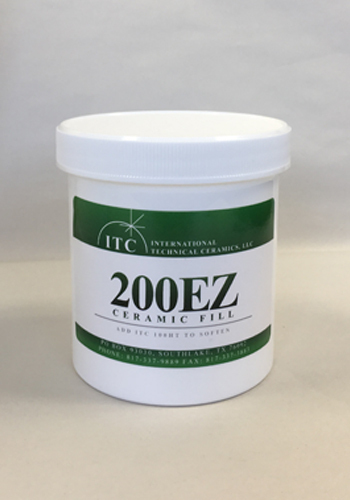 This material is applied over the base coat of ITC-100, ITC-200EZ or ITC-213.